Our advanced artificial lawn technology makes our grass the hardest wearing, most resilient in the UK…proven by science. What is Instant Recovery® Technology? Instant Recovery® Technology ensures your artificial lawn looks better, for longer, even with heavy use. Our products that utilise this innovative technology incorporate the highly durable, highly resilient Nylon (Polyamide) fibres. This ultra strong plastic enables the artificial fibres to spring back to their original condition from foot traffic and garden furniture, creating the most resilient artificial grass in the UK. When choosing artificial grass it’s important to search for a turf that will give you the best value for money and return on your investment. Artificial grass can be manufactured from either polypropylene, polyethylene or nylon. 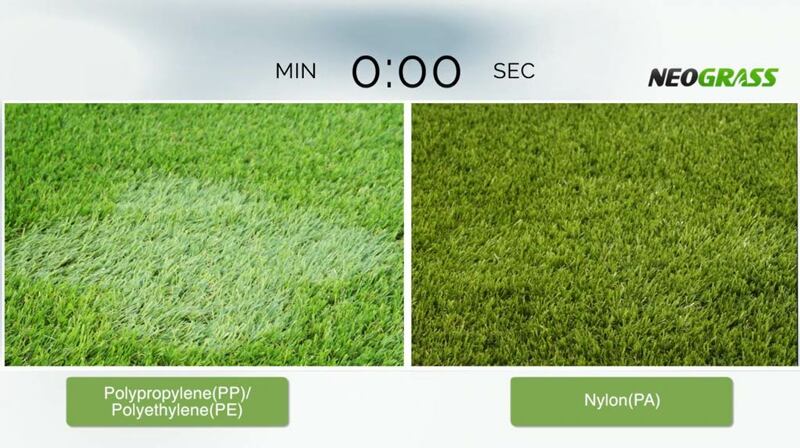 To produce the highest quality artificial lawn, nylon outperforms and outlasts all other synthetic fibres. It’s a well known fact that nylon is the strongest and most resilient fibre in the textile industry. Because of its high strength, it’s used to make parachute cord, fishing lines, tennis racket strings and, of course, the best quality carpets and rugs. The strength of nylon makes it a superior choice for manufacturing artificial grass as it will outperform and outlast other types of synthetic fibre, allowing it to stand up to heavy use. This makes it perfect for families and pet owners who like to get the most out of their gardens and lawns. Over time, continuous foot traffic and garden furniture can cause synthetic fibres to break down – resulting in an artificial lawn with a flat, unnatural appearance, with fibres that lack the ability to recover to an upright position. 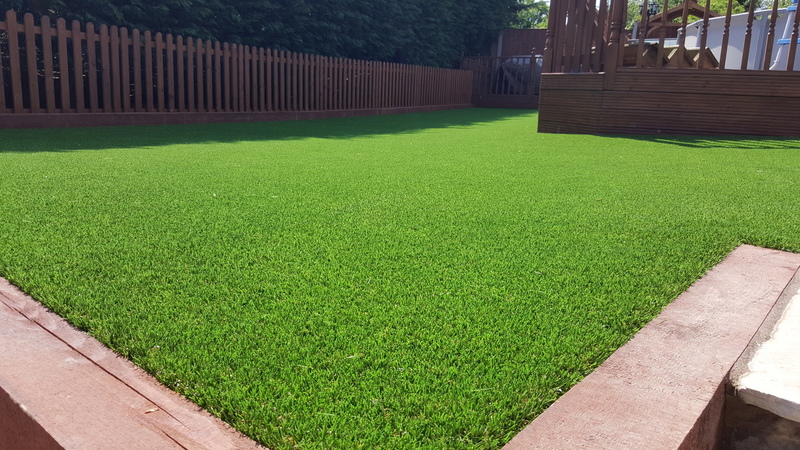 Artificial grass manufactured using nylon will enable your lawn to ‘instantly recover’ from foot traffic, garden furniture and your dogs and pets with ease. When choosing the best fake grass be sure to compare the raw materials used to manufacture your artificial lawn. The true test of an artificial lawn is how it looks several years after installation. Due to its solid, spring-like structure, Nylon does not break down as quickly from foot traffic or general wear as other types of synthetic turf fibre, ensuring a high performing lawn that’s manufactured to last. The suns rays can cause polypropylene and polyethylene fibres to become pliable and lose their ability to bounce back. Due to its higher melting point, nylon can withstand the suns rays and hold its shape, making it more resilient and super-springy. Nylon outlasts inferior polypropylene or polyethylene fibres reducing the need to replace or recycle your artificial lawn as often, making it kinder to the environment. It also makes your artificial lawn a fantastic investment. We’re convinced that our artificial grass cannot be matched on quality or durability that’s why we offer a 10 year warranty on all of our products that incorporate our Instant Recovery® technology.